In 1821, with our independence from Spain, the Isthmus of Panama was divided in two provinces, Panama and Veraguas, the Province of Panama got the Major’s Offices of Portobelo, Chorrera, Nata, Los Santos y Yavisa. Chitre, which was in its beginnings a small native town, depended on the Major’s Office of Nata, comes to be part later of the Major’s Office of Los Santos. This city was founded on October 19th, 1848, and the governor of the province in that time was the General Tomas Herrera. Chitre, in its historical transformation, on 1855 comes to be part of the found Province of Azuero and change its denomination of Parish district to District of Chitre. Again, in 1860 with the elimination of the new province by the constituent assembly and found the Province of Herrera, Chitre comes to be part of the Province of Los Santos (1864) and was not until 1915, under the administration of Dr. Belisario Porras, when the Province of Herrera was found definitely with Chitre as its head city. With the Law No.103 of July 12 th, 1941, Chitre comes to be head city of the Province of Herrera and Los Santos until December of 1944 when the law is repealed, getting its previous status. This request was held by the representative Dr. Julio Arjona Q., before the plenary assembly, on January 18 th, 1915, the assembly national decree the law 17 of 1915, additional to the law 55 of 1914, reformed from the same law and of from the laws 27 of 1910 and 45 of 1912 and article 5 of the law 89 of 1904. Chitre, which was head of the already vanished province of Azuero and subsequently of the province of Herrera, with a surface of 91.1 km², with a population of 34,747 inhabitants by a percent of 381.4 inhabitants by km² (census of 1990). In request of the representative Dr. Julio Arjona Q., the plenary assembly on January 18 th, 1915, this decrees by means of the law 17 of 1915, additional to the law 55 of 1914, reformed from the same law and of the laws 27 de 1910 and 45 of 1912 and of the article 5 of the law 89 of 1904. It is said that the founders of Chitre, were Mr. Ventura Solis, Matias Rodriguez, Jose Rios, Jose Maria Benavidez, Ildelfonso Perez, Blas Tello, Eugenio Barrera, Jose Burgos, Carlos Rodriguez, Jacinto Sanchez. This is the third province in production of corn as well as sugar cane. The commerce in retail prevails, also the repair of personal possessions and household goods. The city of Chitre suits the development of the industry, commerce, and services (banks, financial, cooperative, etc. ), also of industries based on the elaboration of leather, alcoholic products and liquors, ceramics, products of clay, factories of tile, block and cement. Besides, there is milk industry and production of cattle (beef). There are farms that breed shrimps and fish and exporting businesses of shellfish and not traditional agricultural products. The province exceed besides in the production of the most popular alcoholic beverage of the country, the "seco". The trademark most marketed, controlling the Panamanian market, is the “Seco Herrerano”, produced by Varela Hermanos, family company based on Pese. The fourteen national baseball championships (not professional competence) obtained by the provincial selection, become it as the province with the greatest number of baseball championships of the country. At present (2006), the province of Herrera has this title. The province of Chiriqui dominated the national baseball during the decade of the 90 th, nevertheless, in the present decade, Herrera obtained the baseball championships in the years 2003, 2005 and 2006. Among others of the sports more practiced in the province, it is the sport of “lazo”, in which the province of Herrera is one of the more outstanding in the national level. The province of Herrera has nine federated teams: "The Taurios" from Peñaschatas, "The Montanos" from Ocu, "Legendary" from Monagrillo, "Rodeo Club" Chitre, "Atletas" from the Ojal, “Criollos” from Herrera, "12 of December" from Llano Largo, "Gauchos" from Pese, "Novatos of Cruz del Rayo" of Limón . 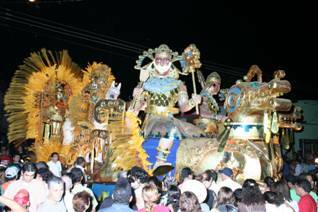 It can not be missed out, the famous carnivals that are celebrated in cities as Chitre, Parita and Ocu. The carnival of Chitre is one of preferred by the Panamanians, although the carnival of Ocu has taken enough fame in the region, since it possesses 3 queens and “tunas”. A traditional float during Carnival on the Azuero Peninsula. Panama is famous for its fiestas during the week of Carnival. Every town along the Azuero Peninsula celebrates Carnival. So when your done enjoying the fishing and amazing beaches of Panama and the Azuero Peninsula drive into Pedasi, Las Tablas or Chitre to experience a unique cultural party.